Majestic Mass are a band from Denmark that plays a psychedelic form of black metal and this is a review of their 2018 album "Savage Empire Of Death" which was released on cassette by Caligari Records. Atmospheric sounding synths start off the album while the vocals are mostly grim black metal screams and on the second track the music goes into a heavier direction along with some psychedelic elements also being added into the heavy parts of the music as well as the solos and leads being done in a very melodic style. Throughout the recording you can also hear a great mixture of slow, mid paced and fast parts while elements of black'n'roll can also be heard at times along with the slower sections of the song showing an influence of doom metal and the riffs also add in a decent amount of melody and on the closing track a brief use of King Diamond style vocals can also b e heard. 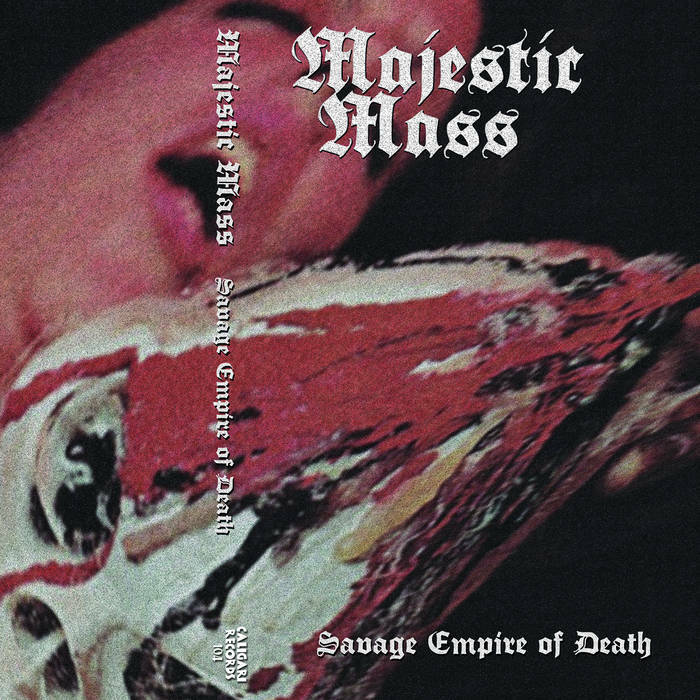 Majestic Mass plays a style of black metal that is mostly mid tempo along with some black'n'roll and psychedelic elements, the production sounds very dark and raw while the lyrics cover darkness and death themes. In my opinion Majestic Mass are a very great sounding psychedelic black metal band and if you are a fan of this musical genre, you should check out this cassette. RECOMMENDED TRACKS INCLUDE "Clandestine Supremacy" "Majestic Mass" and "Savage Empire Of Death". 8 out of 10. This is a review of another recording from Canada's Blasphemy this time a rare rehearsal from 1989 which captures their very raw take on black and war metal and the demo will be released to the masses in September by Nuclear War Now! Productions and called "Blood Upon The Soundscape". Distorted amp noises along with some evil sounding black metal screams and demonic growls start off the recording before going into a very fast direction which also uses a great amount of blast beats and harsh noises along with the solos and leads also being done in a very raw and chaotic style. On the second track real guitars are brought into the music and also bring in a great mixture of slow, mid paced and fast parts while the tremolo picking gives the songs more of a raw and early war metal feeling as well as all of the musical instruments having a very powerful sound to them. 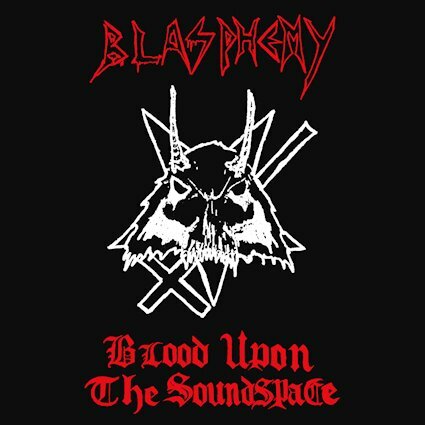 On this recording Blasphemy had more of a raw approach to their early black/war metal by making the music more distorted and harsh, the production sounds very dark and raw while the lyrics cover war, death, Satanism, rituals and darkness themes. 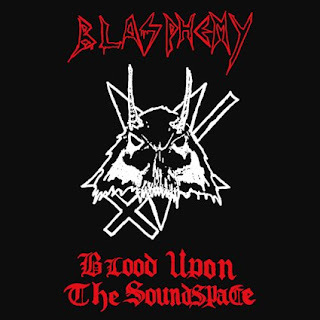 In my opinion this is is another great sounding recording from Blasphemy and if you are a fan of this band, you should check out this rehearsal. RECOMMENDED TRACKS INCLUDE "Hording of Evil Vengeance" and "Goddess of Perversity". 8 out of 10. 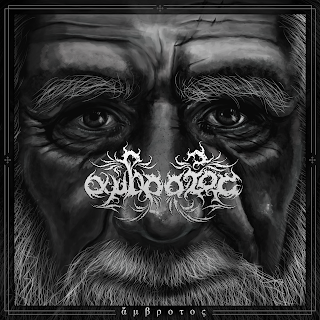 Ambrotos are an international band with members from both Greece and Mexico that plays a philosophical form of black metal and this is a review of their 2018 ep "ἄμβροτο" which will be released in September by Sleaszy Rider Records. Clean playing and synths start off the ep before adding in a powerful sounding bass guitar which also takes the music into a faster direction which also uses a great amount of tremolo picking and blast beats which also gives the songs more of a raw feeling while the vocals are mostly grim black metal screams. Both of the songs are very heavily rooted in the old school Greek tradition while clean vocals can also be heard briefly along with the solos and leads being done in a very melodic style as well as both of the tracks being long and epic in length and the songs also bring in a decent mixture of slow, mid paced and fast parts and spoken word parts can also be heard briefly. 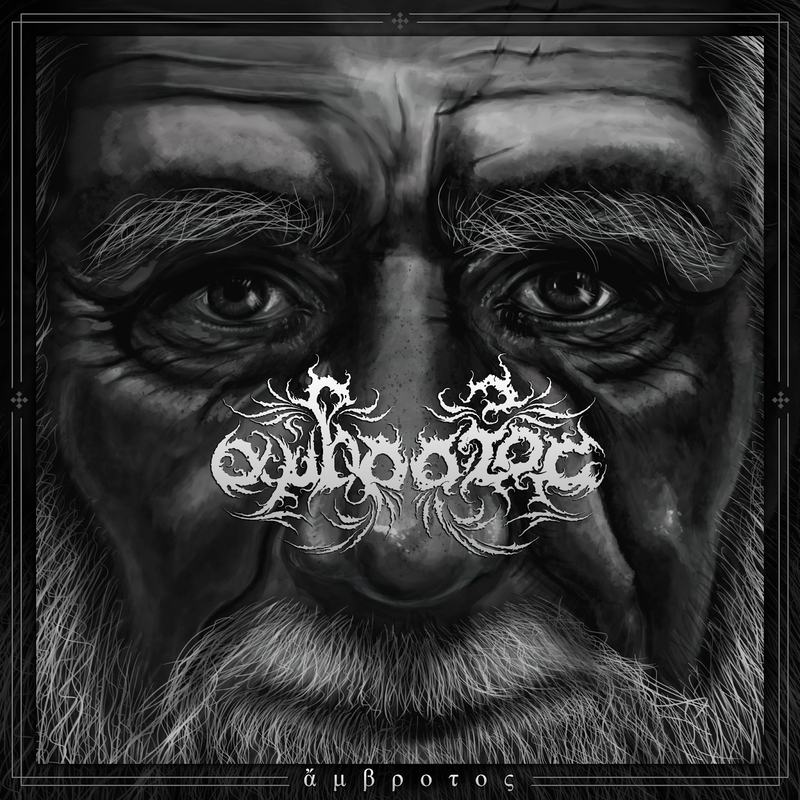 Ambrotos plays a style of Greek black metal that is very heavily rooted in the 90's era, the production sounds very dark and raw while the lyrics cover pre Socratic philosophy and ideas. In my opinion Ambrotos are a very great sounding philosophical black metal band and if you are a fan of this musical genre, you should check out this ep. RECOMMENDED TRACK "Dimensional Rivers". 8 out of 10. It is a project started by myself and T.W. We really just wanted to create music and honestly had no notions or ideas of what it would sound like. There was really no “vision.” Everything was created very spontaneously with very little communication about what it should or shouldn’t be. We just worked towards some type of finished product. 2.Recently you have released a demo, can you tell us a little bit more on what you wanted to achieve musically with this recording? We just wanted to create some music. We agreed upon doing a recording and just went from there. 4.What is the meaning and inspiration behind the name "Heathid Equis'? Rather than find words to use for a name or debate over their significance, we opted to create our own. 5.Can you tell us a little bit more about the artwork that is presented on the demo cover? Simplistic and symbolic, it’s the way to go. 6.Currently there are only 2 members in the band, are you open to expanding your line up or do you prefer to remain a duo? I think we started this project without really knowing or putting too much thought into where it would go. I don’t really think we know what will happen in the future. 7.The demo was released by 'Grey Matter Productions', how did you get in contact with this label? That was all T.W. and they’re amazing for doing the release. I don’t really read much online metal stuff, but what I have seen has been positive. I don’t think we know the answer at the moment. We will just have to see what happens. We never had any discussion about what we wanted as far as a particular sound going into the recording process. There was no writing session or brainstorming. We really didn’t have an influence or a list of bands we wanted to draw from sonically. I know on my end I just tried to translate how I felt into music. As far as what I listen to, it really varies from week to week. Mostly old metal, classic rock and 80s pop. I rarely listen to anything new. I’ve always been drawn to occult based visual imagery as well as lyrical imagery, but as far as it being a direct influence though, I’d say no. Just a thank you to those who gave us a listen. Holocausto em Chamas are a band from Portugal that plays a very raw form of black metal and this is a review of their 2018 album "לָשׁוֹן הַקֹּדֶשׁ" which will be released in October by Harvest Of Death. A few seconds of silence starts off the album before going into a heavier direction which also introduces grim black metal screams onto the recording while ritualistic synths can also be heard briefly and when the music speeds up a great amount of tremolo picking and blast beats can be heard which also gives the songs more of a raw feeling. Throughout the recording you can also hear a great mixture of slow, mid paced and fast parts while all of the musical instruments have a very powerful sound to them along with the music also being very heavily rooted in the 90's style as well as synths also making a return as the album progresses and a couple of later tracks also adds a small amount of dark sounding melodies onto the recording and you can also hear some touches of doom and death metal in some of the riffing. 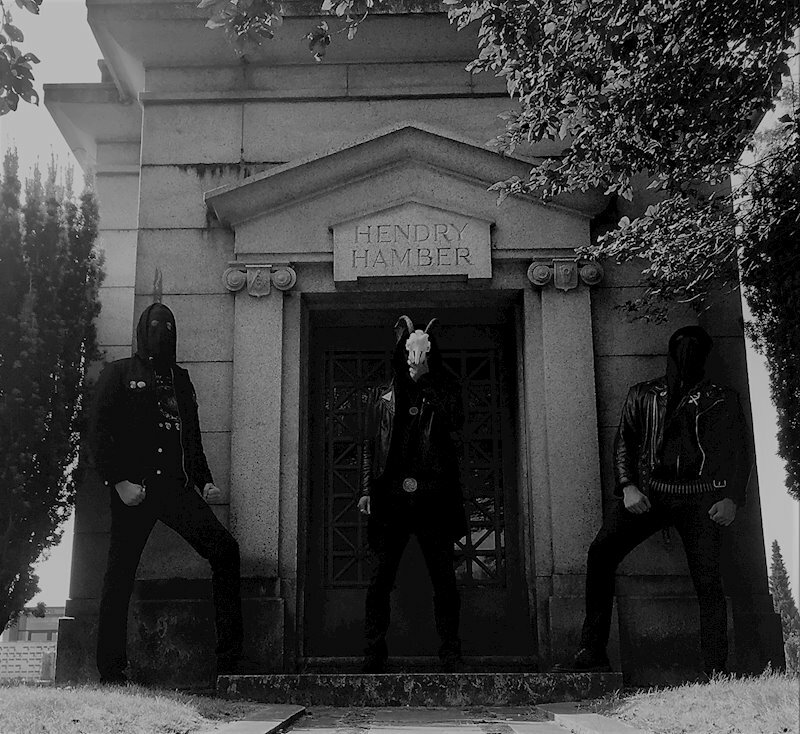 Holocausto em Chamas plays a style of black metal that is very primitive, old school and raw sounding, the production sounds very dark and raw while the lyrics are written in a mixture of Portuguese and English and cover dark and blasphemous themes. In my opinion Holocausto em Chamas are a very great sounding raw and old school black metal band and if you are a fan of this musical genre, you should check out this album. RECOMMENDED TRACKS INCLUDE "Death Messiah" "After The Crucifixion" "From The Catacombs" and "The Sombre Disciple". 8 out of 10. Greetings, and thanks for the interview! 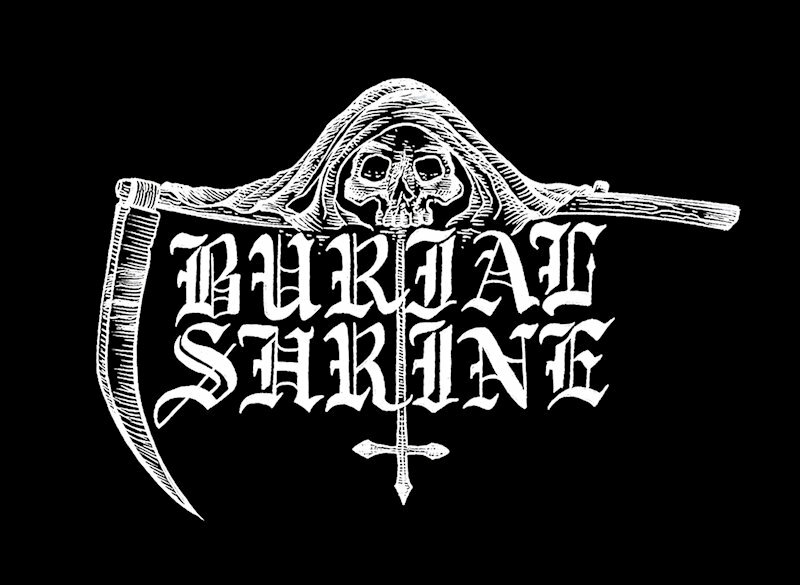 Burial Shrine is a black metal band from Vancouver, Canada. We formed in early 2014, and are comprised of members RW, EH, and CXM. This interview is being answered by the songwriter and lyricist of the band. My identity, and the instrumental roles of myself and the other full members are of no relevance. We formed the band with the intention of playing hard and furiously. This is exactly what we do. 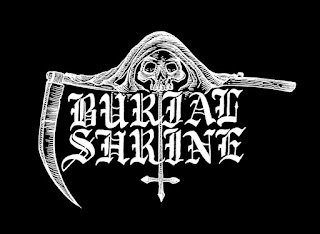 Burial Shrine plays Satanic black metal exclusively. 2. You have your first full length coming out in September. Can you tell us a little bit more about the musical style you went for on this recording? It would be foolish to call our style anything other than black metal. And within that label, I would not view it as anything too unique per se. Tremolo picked guitars and blastbeats are the most common elements, and the sound is raw and abrasive. I think that most listeners will hear some nods to the western Canadian lineage of black metal, in bands like Conqueror and Blasphemy. However we tread our own path, and our overall sound is quite different. We play with a lot of melody as well, which brings some dynamics to bear. It is this back and forth between aggression/brutality and more melodic/meditative moments which ended up becoming the style on this record. In the end, we gave this everything we had, and I believe that the energy and intensity shines through the recording. 3. I have read that it took 4 years to write and complete the album. Can you tell us a little bit more about the process? Indeed, its been a long run. RW and I had worked on previous projects together, but I wanted to do something more aggressive than those. As did CXM. This is where Burial Shrine comes in. Initially the project had this aggressive stylistic restraint on it. I actually wrote around 5 songs fairly quickly for the project from winter to spring 2014. I remember that we eventually recorded some scratch guitars and drums for them, but things moved slowly - I was living in another city at that time. Then hard drives died, rough demos were lost, and the project sat in limbo. This ended up being the best thing that could have happened. A lot of living was done during the following years. I would occasionally work on the songs, tightening them up, but they remained largely the same. As time went on I grew a lot, and the songs began to feel juvenile and dishonest to where I was at that point. It wasn't until the spring of 2017 that I decided to remove all the stylistic restraints around the project, which was a very freeing thing to do. I then rewrote and reworked much of the material. A lot of the riffs and song structures remained the same, but many new parts were added as well. Some songs were discarded completely, and new songs were fully written in their place. The remains began to feel a lot more honest and personal to me, and they became much more representative of my own voice rather than trying to copy someone else's. They actually ended up being more aggressive than they would have been originally, interestingly enough. The final breakthrough came when I killed off my other project. I had lost steam on it, although I thought the songs were very good. Those unused songs were written during the same years as Burial Shrine, and I began to see that they belonged to a singular vision. There was no need to separate my musical personalities anymore - the more melodic and the more aggressive. It was when I combined the two and reworked the other songs to fit into the Burial Shrine frame that things really began to feel finished. 4.Can you tell us a little bit more about the lyrical topics you have explored on the album? The lyrics on this album are quite personal. They deal with man's quest for truth in this dark age which often seems to be doing everything it can to obscure and bury it. They deal with conviction regarding the paths I walk, perseverance through struggle and suffering, as well as self-reflection and discovery. This results in coming to terms with the divine, finding wisdom in darkness, and strength in the guiding hand of Satan - the adversary. Of course the lyrics are often quite dark, but this is not their main focus. The focus lies in the endurance and the striving of the heart after spiritual ascension, which - as we see in the lyrics to the final track written by Johannes Nefastos - may not actually bring the comfort we seek. 5.One of the tracks has lyrics written by Johannes Nefastos. Can you tell us a little bit more about your interest in the anti-cosmic, left hand path, satanic and occult arts? Indeed. The writings of Johannes have been very inspiring to me and play a large part in my personal path. I reached out to him to see if he would be interested in contributing, and to my surprise and great gratitude, he was. It was an honor to have him write the words to the final song on the album. As to your question - I have no interest in being much of a spokesperson for the occult. I prefer to keep my views private and among those close to me, through more appropriate avenues than a band interview. I am a student, and not a very good one at that - and my views are ever evolving, but I will do my best to answer you very briefly. Here I speak only for myself, as other members of the band are free to hold their own beliefs. I do not relate much to an anti-cosmic philosophy. Of course it is easy to feel hopeless regarding the current state of mankind & the world/universe at large, and to wish for the end of all. I often do myself. But these are emotions. Practically, to seek to bring about this end through violence and force, to strive towards destruction, can only bring about further suffering, both for the anti-cosmicist as well as others. I believe the "end" must come about naturally, as it will, thus beginning the cycle anew. I believe that release from the bonds of this world can only come about through serious spiritual work, striving and ascension - not through the violence and destruction of an anti-cosmic philosophy. I actually played with this a little bit in the lyrics of "To Scorch The Earth", which is full of apocalyptic visions of destruction. But the key to that song lies in the phrase "Igne Natura Renovatur Integra" (through fire shall nature be reborn whole). This phrase obviously fits into the theme of the song literally, but also esoterically in its alchemical meaning - fire being representative of the spirit and fire in our hearts. I am a pantheist first and foremost, deriving from my love of nature and its beauty. This eventually led me to hold an occult world-view. I also identify as a Satanist and left-hand path practitioner. This is the path that ended up making the most sense to me, arrived at from lived experience. However, I believe that the left-hand path's focus on individual freedom and the Self is missing a piece of the puzzle. Value can be found in the right-hand as well, with its focus on "the other". The two paths can be walked as one. This is something I am striving towards and am still in the learning stages of. There is much more to say on these matters, but I will let our music and lyrics speak for themselves from here on out. I don't think anyone should put too much stock in my words. Obviously my answers are very simplified for these large subjects. If these topics are of interest, there are many books and avenues of exploration to follow. The reader should come to their own conclusions, from personal experience and study of those much more learned than I. 6.What is the meaning and inspiration behind the name 'Burial Shrine'? Quite literally, the name stands for a shrine to the dead. It could be a grave. For me personally, as time has gone on, it has come to represent a shrine to the dead aspects of myself that have fallen away and will continue to do so as I move forward along my path. Another way to interpret the name is to see our music as a shrine, an offering to this dying world. One can take from the name what one will. Of course, the shadow of the reaper hovers above our logo, which is of relevance as well. 7.Can you tell us a little bit more about the artwork that is presented on the album cover? The logo and the artwork of the album were created by my good friend Casper Macabre. We wanted to keep the album cover simple. The sigil on the cover was created by RW, sometime in 2011 I think. It is comprised of an inverted cross, with an equal armed cross running through it. The sigil seems to have the ability to mean different things to us at different times, and it is thus ever-evolving. Its meanings must be kept among the band members, but it remains a powerful point of focus for us. Thus it was the perfect centerpiece for the album. In this instance it was artistically rendered to be made of bridges, obviously due to the title of the album and the lyrics of Johannes. 8.In the one picture I saw of the band members you were in masks, and very little information is provided on the websites. Do you prefer to keep your identity a secret? We do. It is our hope that the music and lyrics speak to each listener according to their own perception and experience. We do not believe that interpreting this particular work through the lens of the makers' identities offers any substantive or authoritative interpretation of it. 9. Has the band ever done any live shows, or would you be open to playing them? At this point, the band has never played live. There are currently a lot of logistical difficulties surrounding this. Were I able to assemble a feasible live line-up with the right people, I would be open to the idea. But should this happen, it would be far off in the future. 10. On the album you also had a few guests. Can you tell us a little bit more about who they are and also their contributions to the recording? As we were recording - actually once the drums, all the rhythm guitars and vocals were done - there were still a few sections of the album that felt like they needed some fleshing out. I had toyed with the idea of playing the bass myself, but I wanted someone who would really add something to it. CM was the obvious candidate. We worked on the songs together for a couple months, and then he was ready to record. He really added a lot of needed sanity to the album. His bass added the necessary backbone which helped to make the frantic guitars more comprehensible, as well as adding a lot of dynamic to the songs. Often his basslines would start to wander and add their own melodies. CM is a very talented musician, and I'm grateful to have him on the album. TS added the molten leads. He is another very talented musician. When we went to record him, we just played him the parts we were thinking about adding to. He would listen through a couple of times - and one take later we would have what we needed. He did this multiple times, and never repeated himself once. The album closes with a solo from MT. He is a good friend of mine, and I'm a fan of his work in Paths. I knew that I wanted him somewhere on the album, and his solo was the perfect way to close things off. This final song also has a violin contribution from TO'S. The repeating melody you hear was written by RW on a piano, and then transcribed by T. The higher-pitched section he plays was improvised on the spot - this is actually my favorite part of the album. 11. On a worldwide level how has the reaction been to your music by fans of black metal that have heard it so far? Thus far, the reaction has all been positive. The album is not yet out of course. But those who have heard it, even just the preview tracks, have almost all mentioned the energy and the intensity behind the recording. I am quite happy with this. I have no illusions about it - the album will not be for everyone. But we accomplished what we set out to do, and I think that shows. 13. What are some of the bands or musical styles that have had an influence on your music, and also what are you listening to nowadays? This is a difficult question. It really just comes from our love of black metal as a whole, all its various styles included. For me specifically, this album is just made up of the sounds that come naturally to me when I pick up a guitar, filtered through my limited ability with the instrument. As I mentioned above, Conqueror was absolutely an influence. If this doesn't show musically, I believe it does in energy and intent. Our own music travels a different path though. I can't really point specifically to where the melodic side of it comes from. These are just the sounds that flow out of me. As to what I'm listening to lately, I don't find much point in sharing. Lots of old bands, lots of new bands. I believe that underground black and death metal is as potent as its ever been, but I don't find much interest in talking about it outside of my existing circles. I listen to Mahler's 2nd, or Rautavaara's 7th and 8th symphonies more than anything else these days. Thank you for the interview! And thank you to anyone who reads this, or listens to our music. Thank you to everyone who played a part in making this album happen - there are not enough words of gratitude. Labyrinth of Bridges comes out worldwide September 23rd on Saturnal Records. Eosphoros are a band from Portland, Oregon that plays an occult form of black metal and this is a review of their self titled 2018 which will be released in October by Iron Bonehead Productions. A very fast and raw sound starts off the album along with a great amount of tremolo picking and blast beats while the vocals are mostly high pitched black metal screams along with all of the tracks being very long and epic in length as well as the songs also bringing in a great mixture of slow, mid paced and fast parts. All of the musical instruments on the recording have a very powerful sound to them while the riffs also bring in a decent amount of dark sounding melodies along with the songs also bringing in a great mixture of both old school and modern influences as well as some tracks also adding in a small amount of clean playing and they also bring in a very ritualistic and drone orientated instrumental before closing the album with a heavier track and when guitar leads are utilized they are done in a very melodic style. 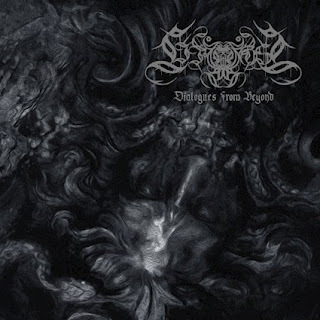 Eosphoros plays a style of occult black metal that is very raw, melodic and traditional sounding, the production sounds very dark and raw while the lyrics cover Luciferian, Gnosticism, Paganism and Anti Society themes. 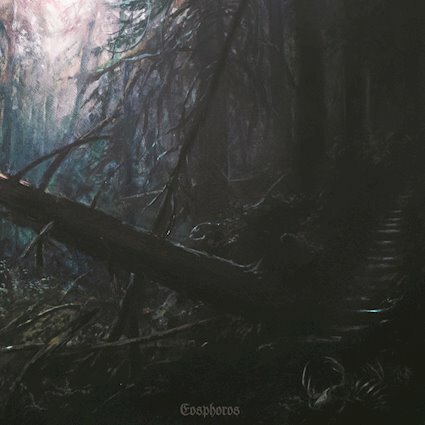 In my opinion Eosphoros are a very great sounding occult black metal band and if you are a fan of this musical genre, you should check out this album. RECOMMENDED TRACKS INCLUDE "Promethean Fire" and "Sylvan Apotheosis". 8 out of 10. Xalpen are an international band with members from Chile and Sweden that has been featured before in this zine and plays a very raw and satanic form of black metal and this is a review of their 2018 ep "Wowk Otrr" which will be released in September by Morbid Skull Records. A short intro starts off the ep before going into a heavier direction while all of the musical instruments have a very powerful sound to them along with the faster sections of the songs also bringing in a great amount of tremolo picking and blast beats which also gives the songs more of a raw feeling. Vocals are a mixture of demonic growls and high pitched black metal screams while the riffs also bring in a great amount of dark sounding melodies along with the solos and leads also being done in a very melodic style as well as a brief use of synths and the songs also bring in a great mixture of slow, mid paced and fast parts and at times the music gets very ritualistic and spoken word parts can also be heard briefly. 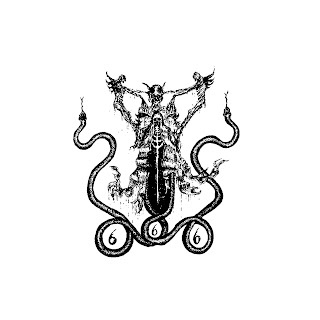 Xalpen creates another recording t hat remains true to the raw style of satanic black metal from their previous release, the production sounds very dark and raw while the lyrics cover Satanism, Shamanism and the ancestral traditions of ancient occult knowledge. In my opinion this is another great sounding recording from Xalpen and if you are a fan of satanic black metal, you should check out this ep. RECOMMENDED TRACKS INCLUDE "Ten Hashpen" and "Wowk Otrr". 8 out of 10. The band formed out of the ashes of a lame rock covers band I was in with the drummer. I grew increasingly tired of playing Pearl Jam and REM covers just to get a gig at the few places in Amsterdam where you can still play live music. We had a prima donna lead guitarist who was totally unreliable and once he left we decided to start playing black metal. It's the music I've been consistently listening to since my teens anyway. The replacement guitarist we were talking to for the rock band decided to give it a go and I knew our bass player via a mutual friend and liked the way he played. I wrote a handful of songs and over the next few months we crafted them into the songs you can hear on the EP. 2. So far you have released an ep, can you tell us a little bit more about the musical style that you worked with on this recording? I had to take into account he fact that my bandmates have all been to music school and wanted to do something more intricate and creative than just aping the brutality of established bands. When it comes to musical training I'm the weak link in the band, which makes writing songs that will keep them interested somewhat challenging. When writing music I generally pursue atmosphere and a deeply melancholic melody. I didn't want any palm muting on the guitar riffs to avoid a 'thrash' sound. I took a risk in the sense that I wanted the riffs to be 'catchy', if they would stick in my head and if my girlfriend (who hates metal) would be singing them after hearing me play them then I'd be satisfied that I had something of sufficient quality. I wrote all the guitar parts on an acoustic guitar which I think gives you an emphasis on the melody - you can add the heaviness later. I am a limited guitar player so there is nothing too technical. The ending of the title track is an example of this - I wrote that riff for the rock band but I always knew it would make a wonderfully mournful black metal riff. The EP was produced by Abraham Sarache, a prog rock musician who lives here and was my singing teacher for a while. He really crafted a defined sound for us. I played all the rhythm guitar parts and we used a vintage tube effect for atmosphere and a Line 6 modern metal distortion underpinning that for power. I also made a point of clearly enunciating all the words, which I believe is pretty original in this genre. 3.You lyrics cover a Utopian society built on Satanic Principles, can you tell us a little bit more about your interest in Satanism or Occultism? I studied philosophy and political science at university and I am really rather worried about the way the world is heading at the moment. The 'Civitas Diaboli' is a call-to-arms for a society based on reason, wisdom and knowledge. 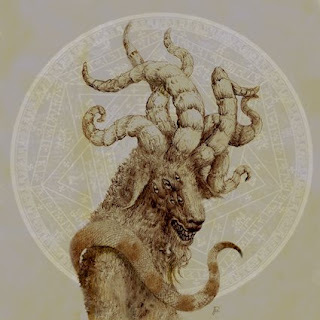 I am by no means a LaVeyan Satanist but I like the stratification that Peter Gilmour has discussed and I feel that the current indulgence of the worst impulses of the masses in some developed countries is utterly revolting. I'm British and during the Brexit debacle we had a government minister declare that the British people 'have had enough of experts'. Well now we are pursuing a direction that risks great damage to the country so we indulge the xenophobia and ignorance of the uneducated. I had to disengage from social media recently as I couldn't deal with idiots who struggle with basic grammar overruling experts on global trade. The misanthropy I feel as a Satanist has been driven into overdrive by such events. Despite this I did want to present a positive vision in the EP, rather than just rant at the masses. I'd generally say that my Satanism is more philosophical than spiritual but for me the line between the two can be blurry. I am very private regarding my beliefs, after all it's hard to justify complaining about Christian evangelism if we are constantly proselytizing our objections to their creed. Let them bleat like the sheep that they are. My beliefs are for myself and my music. 4.What is the meaning and inspiration behind the name 'Era Distolas'? If you're a cynic you might say that Distolas is one of the only remaining obscure demons whose name has not yet claimed by a metal band. If you're not you might assume that the band's leader is well versed in medieval demonology. 5. Can you tell us a little bit more about the artwork that is presented on the album cover? It's a take on the cover of an edition of The Revolt of the Angels by Anatole France. 6. Has the band had any opportunity to play an live shows and also are there any gigs planned for the future? Amsterdam is a great city to live in, but is far from ideal from the perspective of performing any sort of metal music. Despite the reputation for rebellion here this City is as mainstream as it gets. We're talking with a few venues about performing. Halloween in a cellar club on the canals is a realistic option. The Dutch bible belt is where the scene is and I'm busy promoting the band to the venues there. (Well, as busy as one can be with a 7 month old baby at home). I am keen to play in France, Belgium and Germany. I have discussed it with a few labels. I have an album written and we are able to craft a polished sound on a low budget which is appealing to labels. We cannot bring thousands of social media followers to a label to negate the need for them to actually do any promotion, however. Reviews from sites such as this really help. I believe that our music can be profitable. I have worked in sales for years and I think I can sell this band. A friend of mine is a bigshot producer in Scotland who has worked with some big name rock bands. He's remixing our EP to give us an alternative mix of the tracks. This isn't because we are unhappy with the current mix, but this guy has an impressive CV and I am keen to see what he can do with it. I'd love to give his name but he doesn't want his good name to be associated with an unsigned black metal band! 8. On a worldwide level how has the reaction been to your music by fans of black metal? I've sent it to people in the UK, Russia and the US and the response has been enthusiastic. It's pleasing to see people listening to it in different countries in Spotify. After the review on this site we got a nice boost in a few different places. 9. When can we expect a full length and also where do you see yourself heading into as a musician in the future? I have 3 new tracks written and am keen to record an album. Our bassist is off to South America for 3 months this autumn which makes things challenging but our producer is replacing him temporarily. The first challenge is to find time to record an album and find a label to support us. The other guys work and I stay home with my baby daughter most of the working week. Hardly ideal. The bands that have influenced me the most would probably be Watain, Belphegor, Funeral Mist and Deathspell Omega. Outside of black metal I like darker classical music; Mussorgsky for example. I come from the town in the UK where Edward Elgar lived and I love his cello concerto. It's in E minor like most great metal songs! The band's lead guitarist has a jazz background. You can hear that in his playing. 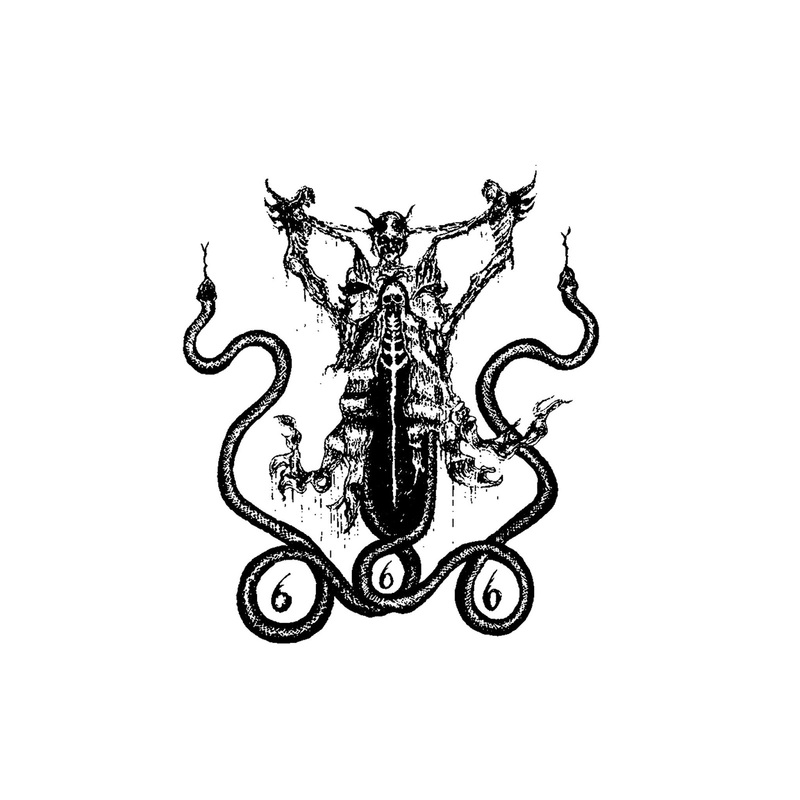 Recently I have been listening to some French black metal like Aosoth and Arkhan Infaustus. I play a lot of sport. I used to be a cycle racer at an elite level and I have been playing rugby for the last few years. My team just won the Dutch championship. I am deeply embarrassed by the links between some black metal bands and Nazism, nationalism and fascism. It's moronic. As well as being utterly vile, these movements are always bound up in religious and social conservatism and black metal musicians and fans would very quickly find themselves being persecuted under such regimes. The Nazis burned books and banned music. If you play black metal and support such policies you're a cretin. It makes no sense to me, but I am glad we live in a free society where people can speak out and make themselves look unpleasant and ignorant. We've been around for five years, aiming at the more uncomfortable elements of DSBM and depressive rock, and are firmly left wing. The band started with just two members - George and Alexander - who met whilst training to be librarians, and wound up sharing a love for a very wide spectrum of black metal (and other related extreme genres). 2.Since 2013 you have released a great amount of material, how would you describe your musical progress over the years? There is much more structure to our songwriting these days, as well as a much larger line-up to draw creative energy from. Most tracks used to form one layer at a time, passed back and forth between whoever was able to contribute, until the song reached a finished stage, but we tend to lock in together to a particular melody more often these days. This varies a bit depending on who is handling the vocals. If that's the role you're taking for that track, you tend to write the lyrics too. For L, who provided guest vocals for the new track on the latest compilation, the source was an old and particularly violent Scottish folk song. For Susan, who sings lead vocals on half the tracks of the latest compilation, they the lyrics are a mixture of an exploration of a mood/psychological state and addressing places or events that have happened (ie: Fortress W, which is about the 'Battle of Wapping' in 1986, and Grand Union was inspired by a stretch of canal near where they grew up that's this mixture of wild and industrial that always made them feel excited and on edge at the same time). For Alexander, the vocals often comprise of almost randomly assembled latin sentences from our namesake, and, in one case, an extended set of questions aimed to provoke an emotional response in people applying for jobs in prison libraries. 4.I know that the band got their name from a list of banned books that where banned from the Catholic Church, do you feel that the church has deprived a lot of people of knowledge over the years along with the Vatican also having a hidden library of hidden knowledge ? The list in question - the Index Librorum Prohibitorum - ceased to be a thing around the same time as the last of the great book obscenity trials (ie: Howl, Lady Chatterley's Lover, Naked Lunch, etc), which I think isn't a coincidence. They probably realised that the days of them telling people - in such a direct and formal manner, at least - what they can and cannot read were definitely over. If you look back further at the volumes (stretching back to the 16th century), they just got thinner with every reprint, so perhaps even that monolithic global influencer could see their strength waning. They definitely have like to keep things covered up, for a wide range of disturbing and entirely predictable reasons that are only in recent years finally coming under the scrutiny they deserve. 5.Can you tell us a little bit more about the artwork that is presented on the album compilation cover? It's a sourced from a 19th century photograph showing a woman from a psychiatric hospital. Knowing what we do now about how arbitrarily people - especially women - were sent to those places, God only knows what she actually did to warrant such a sentence. The more time you spend thinking about how fear and misogyny governed the make-up of those places, the worst you tend to feel about humanity. 6.One member lives in the United Kingdom while the rest of the band lives in Australia, how does this work out in the recording process? Quite well, actually. Most of the recordings are done on very basic recording programs, and most of the vocals from Susan are synched up simply by having them count in to a click-track at the start of the track. Once we realised how well that works, it was really liberating. It gives us all more autonomy, and we don't need to go through a gate-keeper with access to and understanding of the more high-end recording software. We've done a handful of live shows, starting with the launch gig for our first album, X, in a zine store in Melbourne called Sticky in 2015. The space is small, but it was very well attended, and was in many respect the ideal location for us: claustrophobic, underground, and dimly lit. The next gig was also in there, and was the first performance to feature Leah on spoken word. The one after that was very different - six of us in person at an impro music night in Fitzroy (inner suburb of Melbourne), with Susan providing a noise backing track. That was the closest to a live metal performance we had done that far - first time with live drums, more than one guitar, particularly intense screaming vocals, Begotten screening over the top of us... it was pretty amazing. Our gigs since then have been similar to that later one. All our gigs so far, though, have improvisation in common. For our next approach to live settings, we'll be going against that approach by playing pre-planned songs with more traditional structure, which is nerve-wracking, but also pretty exciting. 8.In the last 5 years the band has released a great amount of material, do you spend a great amount of time writing and creating music? It can take some time for tracks to come together, especially now that we've formalised the process, though as most of us are also rooted in noise music, we like to keep a random element to things - like, allowing for a layer to fall where it falls in the recording process, then work other layers around that. There was a one hour long collaborative track we did with a Sydney solo musician named Frances Piers, which involved a lot of montage, but also a reasonable amount of quiet precision. That was an amazing project. Often the most satisfying tracks are the ones that come easiest, but as we keep changing, it never quite feels right to stick with what's easiest. 9.The band has also been a part of a great amount of splits, can you tell us a little bit more about the bands and musical projects you have shared these recordings with? Most of them have at least a member shared amongst them. Shallow, who put out a split demo with us way back at the start (recorded in late 2014), is the solo noise project of Alexander, that has stopped and started somewhat since 2010. The Church of Hysteria, which shared a split that featured the first live Expurgatory performance, is also another project of Alexander, though this time a loud take on stripped back indie rock. Colostomy Baguette? is a harsh noise group involving Alexander and the vocalist for Religious Observance - Wayniac - as well as Susan (performing as K-Hole) and a recently passed away member, The Shitter, who managed to make it quite surprisingly profound in recent years (which nobody expected when the name was chosen). Hadal is a more recent project involving George on guitar, Alexander on bass and vocals, and Wayniac on lyrics. Sludgy, sparse, funeral drone/doom, that was started to experiment with other forms of more direct heaviness. 10.On the last full length the band did a cover of Hellhammer's "Messiah", what was the decision behind doing your own version of one of their songs? The song actually first appeared on an EP in 2016, though we wanted to put it out there again to honour the memory of Martin E. Ain, who died a month before the album came out. This was a favourite track for us for some time, so deciding whether to give it an extra polish and a chance to be heard didn't take much deliberation. It's probably the best track from the first wave of black metal (a tough call to make, and one that will likely enrage folks and/or make them do eyerolls). 11.Currently you are unsigned, are you looking for a label or have received any interest? We've released albums and splits through labels in the past, and both of these are sensational DIY focussed operations. We'd definitely be interested in getting an extra leg-up from a label down the track, as we've all got an absurd amount of commitments, and all work full time, so the completely DIY approach only takes us so far, exposure-wise. 12.On a worldwide level how has the reaction been to your music by fans of black metal and experimental? We're mostly unknown, though we've had a couple of nibbles here and there. It's hard to tell these days. Social media gives you the sense that you can guage interest in and engagement with your art, but it also messes with you a lot. Getting a handful of direct responses from people means a lot more than a whole bunch of numbers, really. Also, when we're able to bring our approach to a live setting, the powerful response is especially humbling. 13.What is going on with some of the other bands or musical projects these days that some of the band members are a part of? 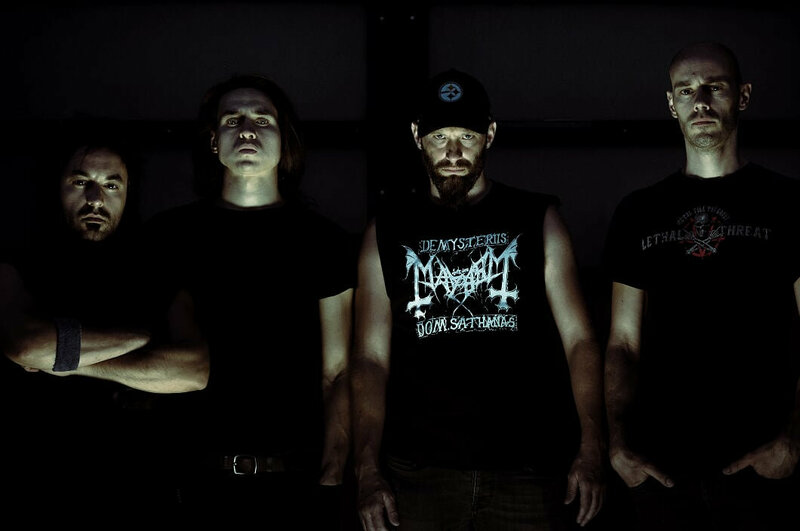 Alexander is the most busy beyond this band, with his doom metal band Religious Observance getting a steadily increasing level of support and interest over th last couple of years. Their work with Shallow has picked up some more too, as has The Church of Hysteria, who are working towards recording their third full length album later this year. 14.Where do you see the band heading into musically during the future? Building on the volume we have produced, which will hopefully lead to a deal where we can get a vinyl LP of our new work put out. We're particularly interested in playing our take on black metal to adjacent crowds - ie: darkwave, queer electro, etc - which may very well blend back into our sound as we work with how that audience engages with us. 15.What are some of the bands or musical styles that have had an influence on your music and also what are you listening to nowadays? 16.What are some of your non musical interests? Esoteric films, books and artwork. Black metal theory is a growing interest, too - it's great that this genre can spread and seep into so many other areas of cultural interrogation and appreciation. 17.Before we wrap up this interview, do you have any final words or thoughts? Thank you again for your interest and time. Hopefully you'll hear more of us in the near future. Sjukdom are a band from Norway that plays a Norwegian style of black metal and this is a review of their 2018 album "Stridshymner Og Dodssalmer" which will be released in October by Osmose Productions. Dark soundscapes start off the album before going into a heavier musical direction while all of the instruments have a very powerful sound to them along with the vocals being mostly grim black metal screams as well as the faster sections of the songs also bringing in a decent amount of blast beats. Dark sounding melodies can also be heard in some of the guitar riffing while the songs also bring in a great mixture of slow, mid paced and fast parts along with the tremolo picking giving the songs more of a raw feeling and the music is also very heavily rooted in the 90's Norwegian second wave style as well as the guitar leads being done in a very melodic style when they are utilized. Sjukdom plays a style of Norwegian black metal that is very heavily rooted in the 90's second wave style, the production sounds very dark and raw while the lyrics are written in Norwegian and cover anti religion, war, disease and death themes. 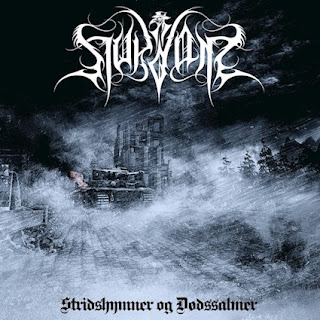 In my opinion Skujdom are a very great sounding Norwegian black metal band and if you are a fan of this musical genre, you should check out this album. RECOMMENDED TRACKS INCLUDE "Dodssalmer" "Med En Fot I Graven" and "Skudd For Skudd". 8 out of 10. Noctem Aeturnus are a solo project from Argentina that plays a very atmospheric form of black metal and this is a review of his 2018 album "Winter Spells" which will be released in September by Naturmacht Productions. Field recordings start off the album along with some atmospheric soundcapes while ambient style synths are also utilized at times along with the heavier riffs also bringing in a great amount of melody as well as the vocals being mostly high pitched black metal screams and clean playing can also be heard in certain sections of the recording. Spoken word parts are also added into some parts of the music while the faster sections of the songs also bring in a great amount of blast beats and tremolo picking which also gives the songs more of a raw feeling along with the music also bringing in a great mixture of slow, mid paced and fast parts. Some of the tracks being very long and epic in length while guitar solos and leads when they are utilized are done in a very melodic style and as the album progresses a brief classical orientated instrumental can also be heard before returning back to a heavier direction and nature sounds can also be heard briefly. Noctem Aeturnus plays a style of black metal that is very atmospheric and epic sounding while also mixing in elements of ambient at times, the production sounds very raw and heavy while the lyrics cover darkness and nature themes. In my opinion Noctem Aeternus are a very great sounding atmospheric solo project and if you are a fan of this musical genre, you should check out this recording. 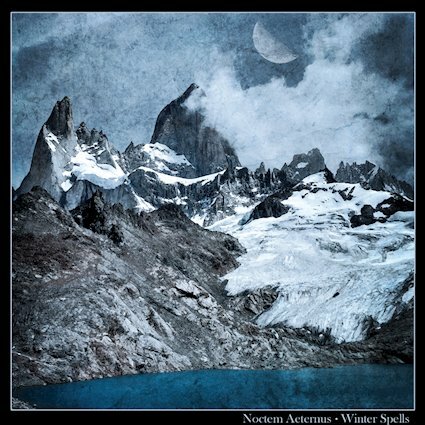 RECOMMENDED TRACKS INCLUDE "Winter Spells" "Nocturnal Mantle" and "The Waning Moon Has Fallen"..8 out of 10. 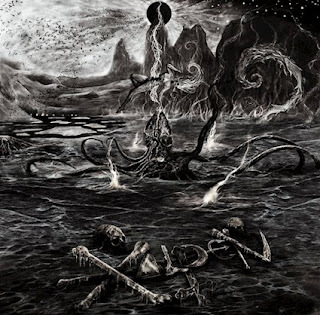 Northern California's Valdur have returned with a new recording which continues the raw mixture of black and death metal from previous releases and this is a review of their 2018 album "Goat Of Iniquity" which will be released in October by Bloody Mountain Records. Dark soundscapes start off the album before going into a heavier direction while the faster sections of the songs also use a great amount of blast beats along with the vocals being bestial death metal growls as well as the riffs also utilizing dark sounding melodies at times and some of the tracks a re very long and epic in length. Elements of war metal can also be heard during the faster sections of the songs while goat sounds and spoken word samples can also be heard briefly on a couple of the tracks along with the tremolo picking also giving the music more of a raw feeling as throughout the recording you can also hear a great mixture of slow, mid paced and fast parts. At the music has its ritualistic moments, as the album progresses grim black metal screams can also be heard briefly while all of the musical instruments have a very powerful sound and when guitar solos and leads are finally brought onto the recording they are done in a very raw and melodic style , noises and synths can also be heard on the closing track. Valdur creates another recording that remains true to the raw mixture of black and death metal from previous releases, the production sounds very dark and raw while the lyrics cover darkness and occultism themes. In my opinion this is another great sounding recording from Valdur and if you are a fan of raw black and death metal, you should check out this album. RECOMMENDED TRACKS INCLUDE "Divine Halls Of Obscurity Pt. 1" and "Inhale The Floodgates Open". 8/5 out of 10. Lifelost are a solo project from Spain that plays a speellbinding form of black metal and this is a review of his 2018 album "Dialogues From Beyond" which will be released in October by Transcending Obscurity Records. A very fast and raw sound starts off the album along with a great amount of tremolo picking and blast beats while the riffs also utilizing a decent amount of dark and dissonant sounding melodies as well as the vocals being deep yet grim black metal screams and the music also gets very atmospheric at times. Throughout the recording you can also hear a great mixture of slow, mid paced and fast parts while the solos and leads are done in a very dark and melodic style along with some spoken word parts also being used briefly, one track also adds in a small amount of dark soundcapes and field recordings before returning back to a heavier direction and clean vocals can also b e heard briefly in the background. Lifelost plays a style of black metal that is very modern, spellbinding, raw and atmospheric sounding, the production sounds very dark and raw while the lyrics cover darkness and death themes. In my opinion Lifelost are a very great sounding spellbinding black metal solo project and if you are a fan of this musical genre, you should check out this album. RECOMMENDED TRACKS INCLUDE "Sepulchral Vault" and "Incorporeal Gate". 8 out of 10. 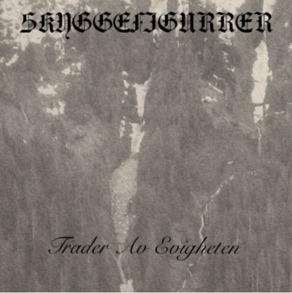 This is the final review of a recording from Michigan's Skyggefigurrer which continues the atmospheric black metal style of the previous release and the ep was self released in 2017 and called "Trader av evighten". A very fast and raw sound starts off the ep along with a great amount of blast beats and tremolo picking while the vocals are grim yet high pitched black metal screams along with the songs also bringing in a great mixture of slow, mid paced and fast parts and all of the musical instruments sound very powerful. Synths can also be heard at times while guitar leads are done in a very modern, melodic and atmospheric style when they are utilized along with some acoustic guitars also being utilized briefly as well as the riffs also utilizing a decent amount of melody and elements of post metal can also be heard at times. On this recording Skyggefigurrer expands on the atmospheric black metal style of his previous release, the production sounds very dark and raw while the lyrics cover dark, metaphysical and philosophical themes. In my opinion this is another great sounding recording from Skyggefigurrer and if you are a fan of atmospheric black metal, you should check out this ep. RECOMMENDED TRACKS INCLUDE "Dodens Flammer'' and "Pakallelse". 8 out of 10. This is a review of another recording from Michigan's Skyggefigurrer which shows the music returning back to a more atmospheric style of black metal and the album was self released in 2017 and called "Kryofolkemord". Ambient style synths start off the album before going into a heavier direction which also introduces grim and high pitched black metal screams onto the recording while the tremolo picking and blast beats during the faster sections of the songs gives the music more of a raw feeling. Clean playing can also be heard in certain sections of the recording while all of the musical instruments have a very powerful sound to them along with the songs also bringing in a great mixture of slow, mid paced and fast parts as well as the riffs also utilizing a decent amount of melody and when guitars leads a re brought into the music they are done in a very melodic style and as the album progresses whispered vocals can also be heard briefly. 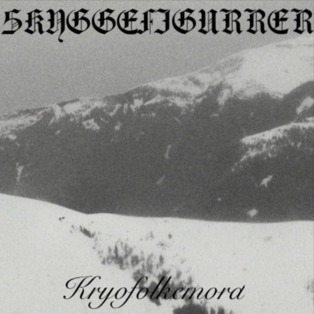 On this recording Skyggefigurrer goes into more of a modern style of atmospheric black metal, the production sounds very dark and raw while the lyrics cover dark and philosophical themes. In my opinion this is another great sounding recording from Skyggefigurrer and if you are a fan of atmospheric black metal, you should check out this album. RECOMMENDED TRACKS INCLUDE "Blant de levende" "Skumringstake" and "Sjelens fengsel". 8 out of 10. 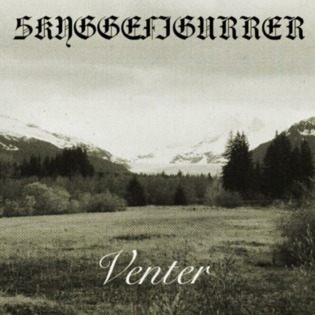 This is another review of a recording from Michigan's Skyggefigurrer which shows the music going into more of an atmospheric post black metal direction and the ep was self released in 2017 and called "Venter". Clean vocals start off the album along with the music going into a very fast direction which also uses a great amount of tremolo picking and blast beats which also gives the songs more of a raw feeling along with a great amount of post metal elements and high pitched black metal screams are also a very huge part of the recording. At times the music gets very atmospheric while the songs also bring in a great mixture of slow, mid paced and fast parts along with the solos and leads being done in a very melodic style as well as mixing in elements of shoegaze which also gives the songs more of a blackgaze style and acoustic guitars are added onto the closing track. On this recording Skyggefigurrer takes his musical style into more of a post black metal and blackgaze direction, the production sounds very dark and raw while the lyrics cover dark and depressive themes. In my opinion this is another great sounding recording from Skyggefigurrer and if you are a fan of post black metal and blackgaze, you should check out this ep. RECOMMENDED TRACK "Venter". 8 out of 10. 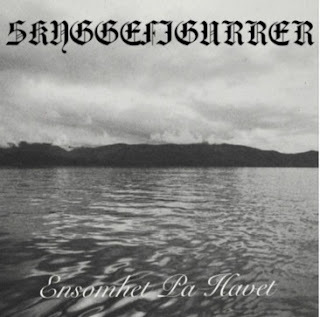 This is a review of another recording from Michigan's Skyggefigurrer which shows the music going into more of an acoustic instrumental and the album was self released in 2017 and called "Ensomehet Pa Havet". Acoustic guitar playing starts off the album while all of the songs are instrumental with no vocals are song writing either utilized along with the guitars also using a great mixture of both finger picking and full chords as well as capturing the atmosphere and darkness of black metal and acoustic guitars are the only instrument utilized on this recording. On this recording Skyggefigurrer moves away from an atmospheric black metal direction to go into more of an acoustic and instrumental direction and the production sounds very dark. In my opinion this is another great sounding recording from Skyggefigurrer and while some black metal fans might not be into it, I can see it appealing to fans of acoustic music and neo-folk. RECOMMENDED TRACKS INCLUDE "Ankor" "Ensomhet Pa Havet" "Stormen" and "Sjomerke". 8 out of 10. 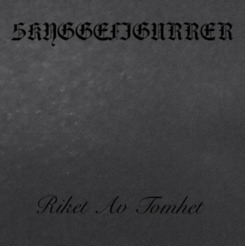 This is a review of another recording from Michigan's Skyggefigurrer which continues the atmospheric style of black metal from his previous release adn the album was self released in 2017 and called "Rivet Av Tomhet". A synth oriented intro starts off the album before going into more of a heavier and melodic direction which also introduces high pitched black metal screams onto the recording along with some clean playing being used briefly and when the music speeds up a great amount of blast beats can be heard. When tremolo picking is utilized they give the music more of a raw feeling while the songs also bring in a great mixture of slow, mid paced and fast parts along with all of the musical instruments having a very powerful sound to them, spoken word parts and death metal growls can also be heard briefly as well as the guitar leads being done in a technical style when they are utilized and as the album progresses a small amount of acoustic gutiars are added onto the recording. On this recording Skyggefigurrer goes for more of a guitar driven style of black metal while still having some atmospheric elements and a touch of death metal, the production sounds very dark and raw while the lyrics cover darkness and death themes. In my opinion this is another great sounding album from Skyggefigurrer and if you are a fan of atmospheric black metal, you should check out this recording. RECOMMENDED TRACKS INCLUDE "Spokelse" "Udodelighet" and "Besittelse". 8 out of 0. 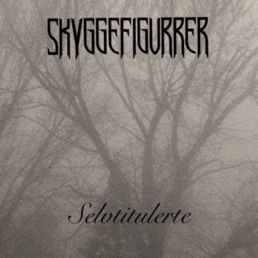 Skyggefigurrer are a solo project from Michigan that plays an atmospheric form of black metal and this is a review of his self released 2017 album "Selvtitulerte". An acoustic guitar intro starts off the album before going into a very fast and raw musical direction which also utilizes a great amount of tremolo picking and blast beats while the vocals range from grim growls to high pitched black metal screams along with some clean vocals also being used at times. When synths are utilized they give the music more of an atmospheric feeling while the songs also bring in a great mixture of slow, mid paced and fast parts along with the solos and leads being done in a very melodic style as well as all of the musical instruments having a very powerful sound to them and acoustic guitars also appear on some of the other tracks, psychedelic elements are also utilized at times and the album also brings in a great amount of acoustic instrumentals. Skyggefigurrer plays a style of black metal that is very raw and atmospheric along with some psychedelic and death metal elements, the production sounds very dark and raw while t he lyrics cover Satanism, Luciferian and Anti Christian themes. In my opinion Skyggefigurrer are a very great sounding atmospheric black metal solo project and if you are a fan of this musical genre, you should check out this album. RECOMMENDED TRACKS INCLUDE "Henrykklelse" "Trolose" and "Lognen som dutror". 8 out of 10.